...and is certified by Guinness to be the first production car capable of pulling a wheelie. Not that they're making a big deal of it or anything. Of course, the Bugatti Chiron was put on display, in this classy deep teal colour. ...probably quite a bit more likely to be actually taken off-road, mind. ...we're hoping that striking blue paint wears hard against the salty spray. The Toyota Tacoma TRD Pro - all the pick-up a kayak enthusiast would ever need. ...as important as it is gargantuan! It's also the first makeover the car has had in quite some time. ...in this deep blue colour, it doesn't look half bad. This extreme Dodge Viper adds to the muscle car ambience of the Dodge stand. We bet it smells of petrol and cigars. The Nissan 370Z Heritage Edition previews the 2018 model year car, which gets minor updates inside and out. The Heritage Edition celebrates 50 years of Nissan's Z-cars. The Honda Civic Si coupé is a dramatic, sub-Type R addition to the Civic lineup in the US. Shame we don't get it in the UK, says Rachel. Mini's plug-in hybrid Countryman is its first electrified model, ahead of the all-electric Mini hatch. Last year's star of the New York motor show - the Mazda MX-5 RF - made an appearance at the show this year. "Norfolk-based Lotus has a single-car show stand but it's not quite finished..."says Autocar news editor, Rachel Burgess. ...this darker grey show car is the four-cylinder, however. The Range Rover Velar made its American debut at the New York motor show, with a special guest appearance from Ellie Goulding to help things along. The Mercedes-AMG GLC 63 Coupé has now been revealed at the show, along with its standard SUV sibling. The two cars use same engine as the C 63 and come in 469bhp regular or 503bhp S guises; sales commence this June. The changes inside correspond with those seen on the C 63 4Matic and C 63 4Matic Estate, with unique instrument graphics, a flat bottom steering wheel, AMG seats and AMG controls on the centre console. Acura's sharply-styled TLX will be revealed in New York later this month. The brand's Precision concept (pictured) has heavily influenced the styling of the luxury saloon. So far, Acura has only shown the car in a murky preview image. The New York motor show isn't the biggest motor show in the motoring calendar, but it's often host to big-hitters of the next 12 months. The Dodge Challenger Hellcat was extreme, but the SRT Demon promises to take it to the next level. New York will be the Range Rover Velar's first outing on North American soil, as the model approaches its sales debut. Infiniti's preview image of the next QX80 shows a prettier front-end than the current flagship SUV. The current QX80 was unveiled three years ago at the 2014 New York motor show. Lincoln's Navigator SUV looks set to give the Cadillac Escalade a run for its money, as Lincoln has confirmed the car's entry into the New York show this year with a preview image which all but reveals the car. We've already got the GT-R Track Edition in the UK, but the model gets an outing at the New York motor show ahead of sales commencing in the US. Toyota's FT 4X concept previews what could be a new FJ Cruiser - the brand's rugged, Hummer-esque off-roader. Despite New York’s nickname of Empire City, it’s never been the empire of the automotive industry in America. That recognition goes to hardy Detroit where, to this day, the main players reside in the suburbs of Deaborn. Nonetheless, the New York show has had some major global reveals – last year, it showcased the F-Type SVR, the MX-5 RF and the R8 Spyder to name a few. This year was more subdued, at least in the way of new car reveals. The major reference points for the UK were the new GLC 63 and GLC 63 Coupe, the latest models from Mercedes’ flourishing AMG performance brand, and a new entry-level F-Type which uses a 2.0-litre four-cylinder Ingenium petrol, built by Jaguar Land Rover at its plant in Wolverhampton, far far away from the bright lights of New York. It’s fair to say that reveals are largely to do with timing – both AMG boss Tobias Moers and Jaguar sports car chief engineer Erol Mustafa admitted that their respective reveals fitted with programme timings. But Moers also noted the obvious – that America is the most important market for AMG, not least with SUVs. 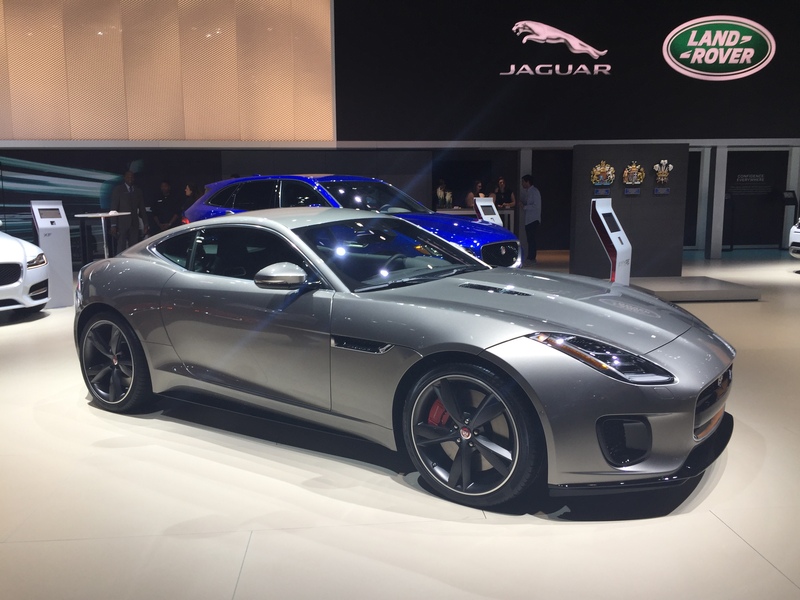 And for the F-Type, it is the second largest market after our little island across the pond. The other notable reveal was the bonnet-heavy Genesis GV80 concept. With Genesis currently a petrol-only saloon brand, the production version of this SUV is set to catapult Hyundai’s luxury arm into the UK market – eventually - so we’ll be watching closely to see what Genesis does next. But really, this show was for the home crowd. If the LA motor show in November was all about electric SUVS – with its star car the Jaguar I-Pace, the New York show was all about sheer brutish American metal. It felt made for a Trump-esque landscape of rolled-back carbon standards. Still, Trump was conspicuous by his absence. At Detroit in January, there was an anxious atmosphere of what Trump’s term would bring and quiet buzz about his possible visit to the show, which didn’t transpire. But New Yorkers are cooler than that. There was no talk of Trump, just a mood of defiance and potential. Any questions I did pose to car execs about Trump were batted off with mutters of ‘no speculation’. It’s clearly still an unknown for car makers, but for now, it’s business as usual. The Dodge SRT Challenger Demon was one of my favourites with all its 840bhp of might and some absurd Guinness World record. And then there was the Grand Cherokee Trackhawk, which lays claim to being the fastest production SUV in the world. There was every expectation that the Trackhawk would look like any other muscley American SUV, but under the showlights and in an unusual shade of red paint, it was a damn fine-looking thing, despite its angular lines and silly name. The Civic Si, an American only Honda which sits between the standard Civic and the Type R also looked good in coupe form. Overheard were several cries of ‘why can’t we have this in the UK?’ And there’s certainly an argument for a softer hot hatch than the Type R, which could put keen drivers off with its aggressive aesthetics. There were a couple of unforgettable beasts too. The Lincoln Navigator – finally replaced after a decade – wasn’t exactly a stunner but was a notable improvement on last year’s concept. 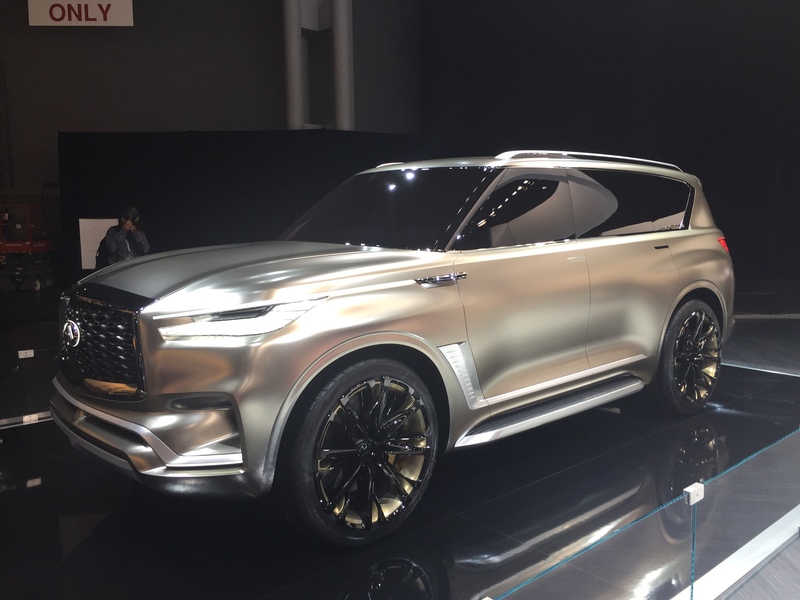 And there was the gargantuan Infiniti QX80 Monograph concept in gold which looked as if it could be lifted straight off the stand and into a showroom in Dubai, where it would be snapped up immediately. In reality, it has been created to portray the brand’s vision of luxury styling. But stray away from the only main hall – a delight after years of the Frankfurt motor show marathon – and you find a smaller wonderland of carefully modified classics, garish pick-ups and stunning heritage vehicles, including a historic collection from the New York police department. These included a thirties Mack, a ’51 Plymouth Concord and something a little akin to a Ghostbusters-style car – but not - all in tip-top condition. 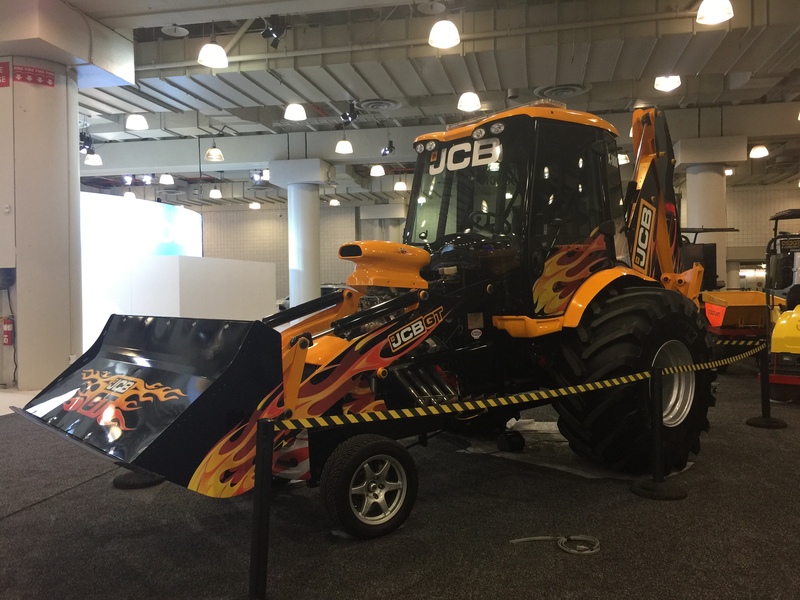 In another corner was a JCB GT – admittedly it has little relevance to any car buyers today, yet when the doors open to the public, kids and adults alike will be flocking to look at the beefy digger. Then there was the aptly named Big Power Racing, where friendly owner Chris showed us around his eclectic collection of modified models. There was a pimped Cherokee, Mustang, Viper but the most exquisite, by far, was a ’69 Camaro with ludicrous rims, metallic burnt orange paint and a price tag of a humble $200,000. And so, New York evidently wasn’t an epicentre for global car reveals this year, but with plenty for the US market and plenty more with heart, the show displayed something not easily achieved. Soul. Not only the soul of the far-reaching automotive industry but also the beloved city in which it is based. We don’t get the TLX (or Honda's upmarket Acura brand) in the UK, but the posh saloon’s new look, which is heavily influenced by the sharply-styled Precision Concept of last year's Detroit motor show, made it a standout car among the stands. The Dodge Challenger Hellcat’s 707bhp clearly wasn’t enough for Fiat Chrysler Automobiles, so they’ve boosted it and added numerous upgrades to make the SRT Demon. It promises to be one of the most extreme muscle cars on the road, although, like the Hellcat, is unlikely to make it to the UK. We’ve seen the GT numerous times, but the show’s choice to put it centre stage on its video poster shows how highly regarded the GT is, even two years after its initial debut. Ford will launch the first hybrid police car for the New York Police Department. Called the Police Responder Hybrid Sedan, the model is based on a Fusion - the American version of the Mondeo - and comes after the firm announced it would add hybrid power to the Mustang, Transit and an SUV. Infiniti’s enormous QX80 flagship SUV got a new look at New York, three years after it was initially revealed. It’s another that’s not destined for the UK, but as the brand continues to grow, it may only be a matter of time before Infiniti bosses consider its viability on these shores. 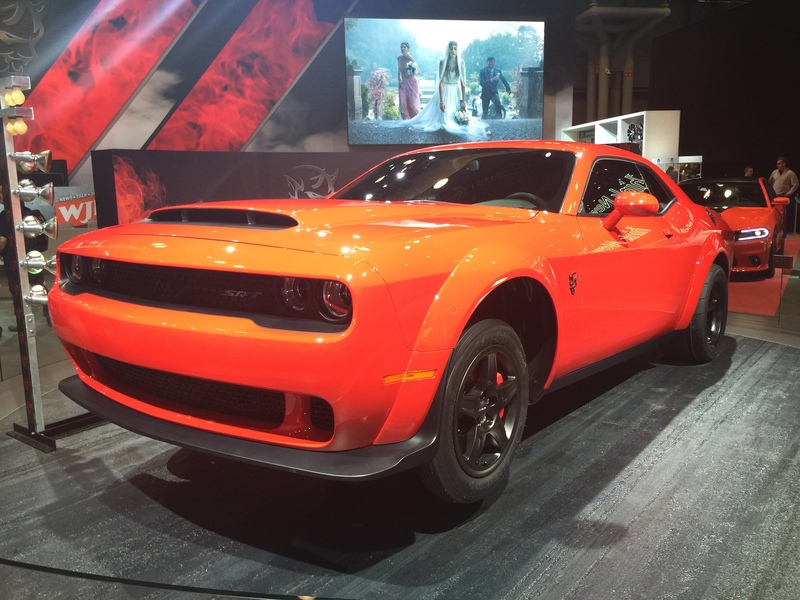 Not happy with one Hellcat derivative at New York, FCA has brought the Jeep Grand Cherokee Trackhawk to the show. It’ll get the same engine as the Dodge Hellcat, which makes it the fastest fossil-fuelled SUV in the world. Lincoln's Navigator SUV looks set to give the Cadillac Escalade a run for its money. It's launched in New York with a twin-turbocharged V6 engine that produces 450bhp. The 370Z Heritage Edition also previews the facelifted 370Z, and will be the first look at the new car we'll get. The tweaks applied to the 2018 model year car include the standard raft of interior and exterior improvements, as well as revisions to the front and rear light clusters. There’s also a new high-performance clutch from aftermarket parts supplier Exedy for manual models. Land Rover’s newest Range Rover model made a splash at the Geneva motor show, and gets its American debut at the New York motor show. The GLC 63 range - SUV and SUV coupé - has just been revealed, but will make their motor show debut at the New York motor show. Both get 469bhp in standard guise, or 503bhp in AMG 63 S guise. Subaru's rugged SUV-estate will be presented at New York, with new tech, including Apple Carplay, improved comfort and more safety features. There's a choice of 2.5-litre or 3.6-litre petrol engines. Toyota has given us a glimpse of its vision for the future of its SUVs; it's on the more rugged end of the SUV scale, suggesting that it could be a replacement for the Hummer-esque FJ Cruiser. I thought the redesign of the last RLX caming before the latest TLX? So wouldn't that mean the RLX would be updated first? While the MDX is the brands money maker, I do understand that the next most important model is the TLX, but, IMHO, it is the RLX that needs the greatest HELP in the looks department! Redesigning the RLX into a carbon copy of the stunning Precision concept, is a no brainer and would almost immediately raise the interest and emotional stock of Hondas luxury brand!